We started this day with the final 3 presentations by me in the classroom this morning at World Resort, followed by the usual great lunch there. For the afternoon we moved over to Chaweng for the final Open Water presentation. Here's a (not so great, I admit) picture of my brand new Mare 42 regulator, the latest of the latest in the Mares range of regulators. 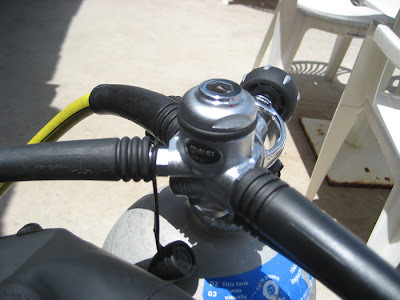 Haven't really had a chance to test the new reg since I've only done two shallow beach dives and some confined water dives with it, but I'll report later on it how it functions at depth. I do expect a great ease of breathing. Here's my regulator together with my new Mares Dragon/AT BCD. A nice occasion to show them off! 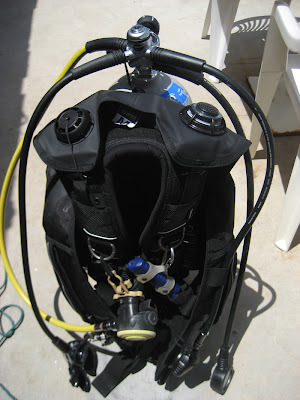 Soon we'll be doing some Instructor level Specialties during which I hope to test both, the reg and the BCD a little better. 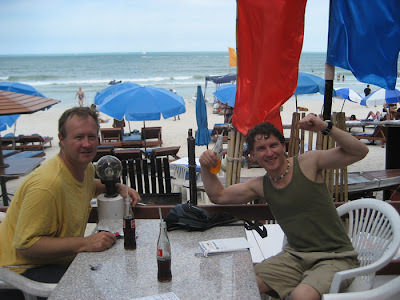 Here are Jamie and Bas after the dive, before their debriefing. They both did very well. Strangely enough, the surf on Chaweng beach was fairly strong, since two days the weather changed for the better and there have been two gorgeous, sunshine filled days, but the beach drastically changed, a flat nice and calm beach all of a sudden turned into a beach with a bit of surf and surge and very low visibility underwater. They both performed very strong however and showed very good control over their respective 'students' and consequently both got very good scores for their skills. 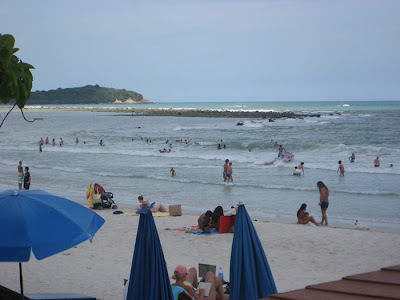 Here's a look over Chaweng beach with loads of happy people standing in the surf trying to body surf their way to the beach. Tomorrow we'll close the close the IDC and then we're over to Koh Tao to attend the IE.